What a beautiful view with the coastline of Altea in the distance! You will be staying in this beautiful apartment by the green Don Cayo golf course in Altea la Vieja. You reach the entrance to this home, which is situated on a single floor, via the garden. The interior is comfortable and well-kept. In the living room, you will find a cosy hearth (electric fireplace) and the sliding doors lead to the spacious balcony with views of the undulating landscape. The kitchen and bedrooms are sleek and very bright. Not only beautiful to behold, but convenient for use as well! On the spacious terrace with cosy sitting area you'll spend many an evening with a nice drink. The terrace has a useful electrical awning over its entire length. You will not have to look far to swim a couple of lengths; the large communal swimming pool with sun terrace is just 25 metres away. A supermarket, bakery, restaurants, bank and post office are located 1 kilometre away in Altea la Vieja. The inland is ideal for trips. Don't forget to visit the imposing Bernia mountain range, which offers some stunning walks. Altea, with its impressive domed church, is 5 kilometres from the apartment and the nearest beach is just 1 kilometre away. 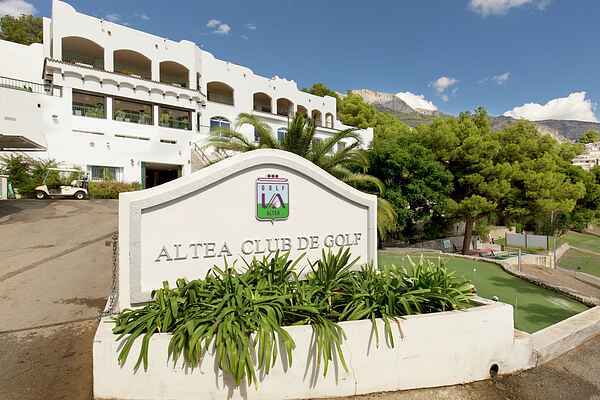 The Altea golf club, with its two 9-hole courses, is practically situated in your back garden.